State Rep. Oscar Longoria is a recipient of the UT Law School outstanding alumni under 40 years old. 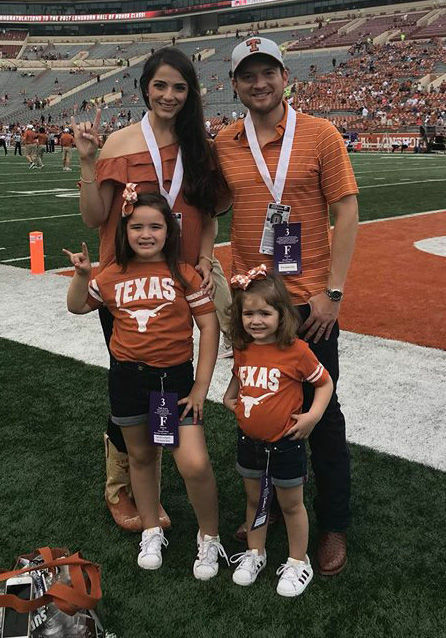 He is pictured with his wife Jennifer and their daughters Camila and Madison on the field before a Longhorns football game. AUSTIN — State Rep. Oscar Longoria keeps climbing to the top. He pulled himself up by the bootstraps and everyone is taking notice. For the second year in a row, the University of Texas is recognizing him for his hard work and dedication. This time, the state representative has been chosen as a distinguished alumnus by the University of Texas School of Law. Longoria, 36, a 2007 graduate, will be named the UT Law Alumni Association’s Outstanding Young Alumnus. “I am honored and humbled to have been selected as the Outstanding Young Alumnus by the Texas Law Alumni Association,” Longoria said. He has been chosen as one of five Texas Law’s most accomplished and illustrious alumni who are being honored this October by the Texas Law Alumni Association and Dean Ward Farnsworth. The awards will be presented at an invitation-only dinner in Austin this October. The Outstanding Young Alumnus Award is presented to a graduate, 40 years old or younger at the time of the announcement of the award, who has made significant achievements in his or her career and service to the University of Texas or the School of Law. Previous recipients of the award include John B. Connally IV, George P. Bush, Scott A. Keller, and Gov. Greg Abbott’s former Chief of Staff Daniel Hodge. Longoria was chosen from a pool of 16 nominees. In the fall of 2017, Longoria was the recipient of the 2017 Outstanding Young Texas Ex Award. That recognition was awarded to Texas Exes age 39 and younger who made significant achievements in their careers and service to the university. He is a Life Member of the Texas Exes Association. In the 85th Legislative Session, Texas House Speaker Joe Straus appointed Longoria as Vice-Chairman of the House Appropriations Committee and Legislative Budget Board. This powerful new appointment builds upon Longoria’s influential leadership position and significant impact on the budget writing process. Additionally, he also serves as Chairman of the Appropriations Subcommittee on Articles I, IV, and V, on the Investments & Financial Services Committee and Local & Consent Calendars Committee. “My education from both the University of Texas and the University of Texas School of Law have paved my career in law and public service,” Longoria said. • Representative Oscar Longoria ‘07, will be named the Association’s Outstanding Young Alumnus. • Houston lawyer and civic leader Richard Mithoff ‘71, who will receive the Association’s Award for Lifetime Achievement. • Dallas-based Sandra Phillips ‘91, Group Vice President and Chief Legal Officer for Toyota Motor North America, will be honored as Outstanding Alumna. • Carrin Patman ‘82, chair of the Metropolitan Transit Authority of Harris County, will be recognized as the Distinguished Alumna for Community Service.